Designed to provide ample green space at its base, Mille Arbres turns design on its head with a reverse pyramid structure that offers a �new way of living in an urban environment that closely combines nature and architecture� within the centre of Paris. Mille Arbres (Thousand Trees) is a 9-storey reverse pyramid structured designed by Japanese architect Sou Fujimoto with Manal Rachdi Oxo Architects. 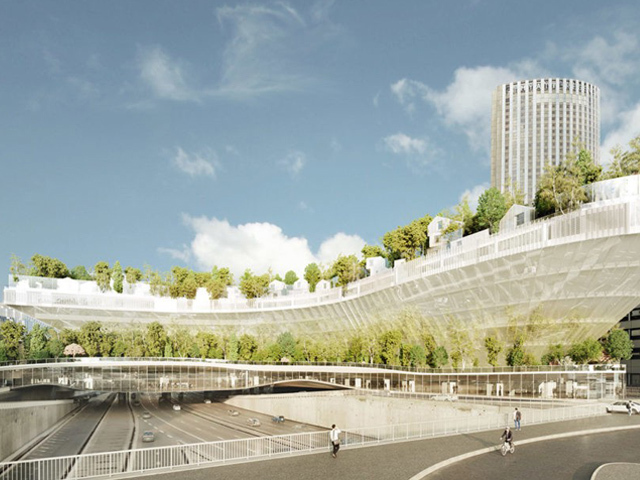 Winner of the three-stage open competition Réinventer Paris, Mille Arbres will be a vibrant green high-rise community that leaves the ground free for park and recreation space. 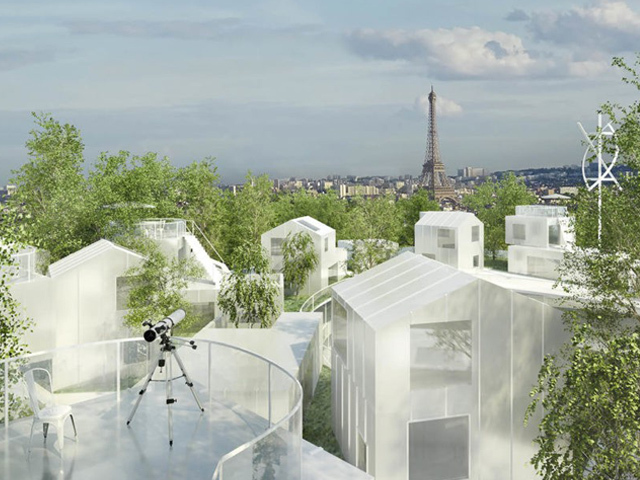 Named for the 1000 trees that will be planted as part of its construction, Mille Arbres is a forest villa comprised of 127 residential units, that, according to Emmanual Launiau, CEO of OGIC, “will invent a new art of living in Paris, the city of the hybrid and sober tomorrow, reconciling nature and architecture. " The 127 residential units on the top of this bold building may be the world’s first village built out of bio-based materials. It is an inhabited natural ecosystem set in the centre of Paris. The 1000 trees that will be planted were selected based on their ability to live in the urban atmosphere. They will serve not only to change the city skyline but also create a buffer against pollution. While the roof of the Mille Arbres comprises a sustainable community in the middle of a forest, the street level of the building is an urban park. Conceived as a work of land art, the park features a characteristic topography that lifts up or slopes down to provide convenient access throughout. Among other things, this landscape offers the experience of a real forest ecosystem. Managed by the Ligue de Protection des Oiseaux (League of the Protection of Birds), it will also be a place for classes and workshops. 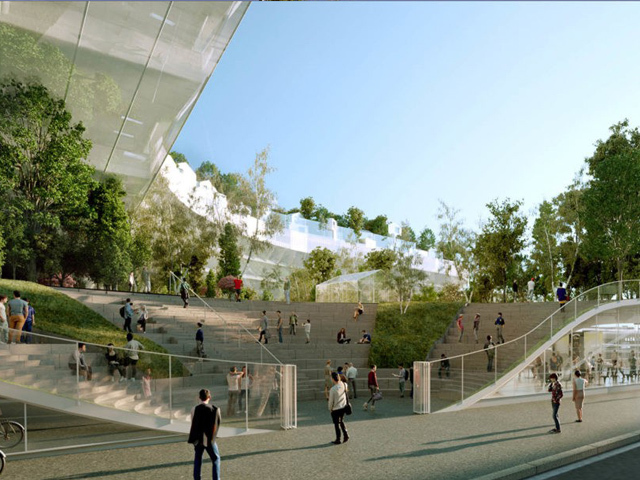 Fujimoto’s Mille Arbres will also include La rue Gourmande, an inner street and food court designed by Philippe Starck. In addition to housing and a food court, Mille Arbres will include a 4-star hotel with 250 rooms, over 27,000sqm of office space, an ultra-modern integrated bus station, and a kindergarten with a large covered playground. 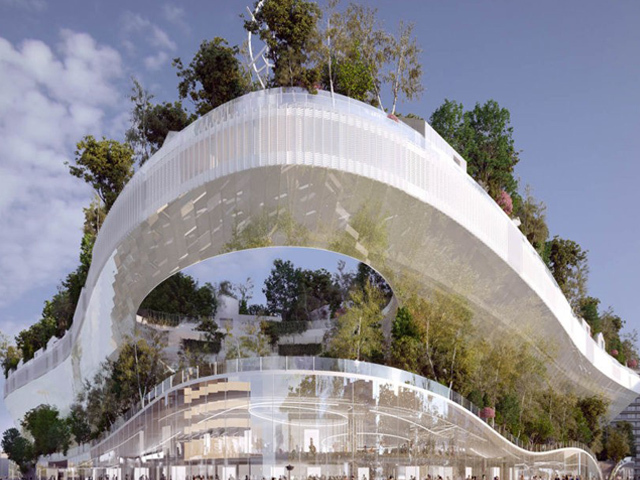 “Parisians and tourists worldwide will be immersed in an environment refuge of biodiversity, unparalleled in an urban environment,” claims the architect. 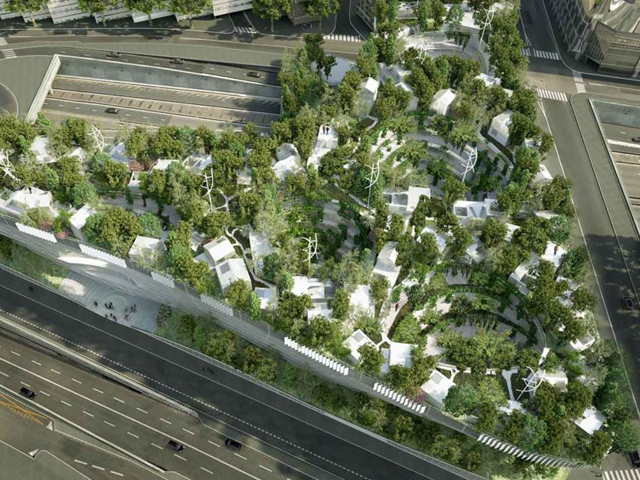 Thousand Trees will rise above the ring road of Paris, bridging the border that currently divides the inner and outer parts of the city. Its construction is expected to be completed by 2022.